130 7th Avenue South: A slew of permits have been filed for the BKSK-designed project coming to 130 7th Avenue South, which was declared “thrilling” during its most recent trip through Landmarks, when it received approval for construction. 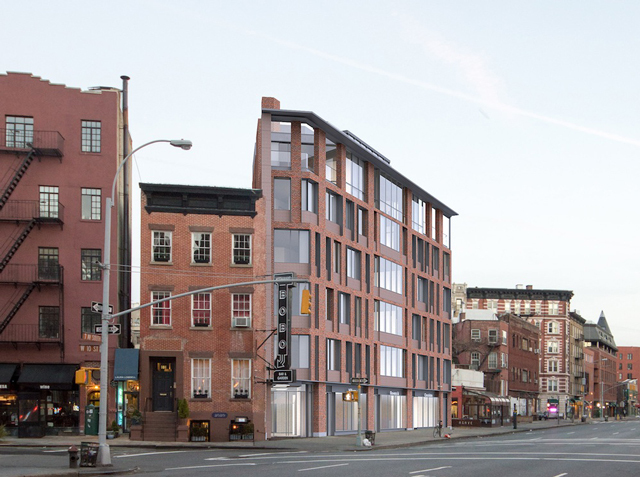 With structural and foundation filings out of the way, work can soon begin on the site, located just above West 10th Street in the West Village. 432 East 162nd Street: Phipps Houses NY has filed for a new residential building at 432 East 162nd Street, which will span 205,422 square feet, including a small commercial component. The 12-story and 203-unit structure is being designed by Magnus Magnusson, of Magnusson Architecture and Planning. 770 East 214th Street: The first new building permits are up for 770 East 214th Street, where Albert Gjonblaj of GGG Realty Group has filed for a 4-story and 8-unit residential building of 6,500 square feet, designed by Fred Geremia Architects. 2361 Nostrand Avenue: Aharon Steinberg of the Marcal Group has filed permits for a nine-story and approximately 50,000 square foot building at 2361 Nostrand Avenue, in Flatlands; Karl Fischer is designing. 178 Court Street: Jamie Anthony of 178 Court Street LLC has filed for a 5,454 square foot commercial building coming to 176-178 Court Street, in Cobble Hill. Sherida Paulsen of PKSB is listed as the architect of record. 801 Flushing Avenue: Susan Wu of 801 Flushing LLC has filed permits for a two-story and approximately 10,000 square foot building at 801 Flushing Avenue, in Bushwick. The structure will be split between commercial and community facility components, with Suresh Manchada of L & C Associates listed as the architect of record. 147-11 3rd Avenue: Abdul Haye of 147 Street Realty LLC has filed for a new two-story single family home of 1,994 square feet at 147-11 3rd Avenue, in Whitestone. The architect attached to the permits is Muzafar Jamal of Architectural Concept Inc.
40-05 Crescent Street: Mike DiFonzo of Crescent Owners LLC has submitted new building applications for a 36,433 square foot structure, split between 11,415 square feet of manufacturing, and 25,018 square feet of residential, divided between 32 units. The 5-story project is being designed by T.F. Cusanelli and Filletti Architects, and is located in Long Island City.